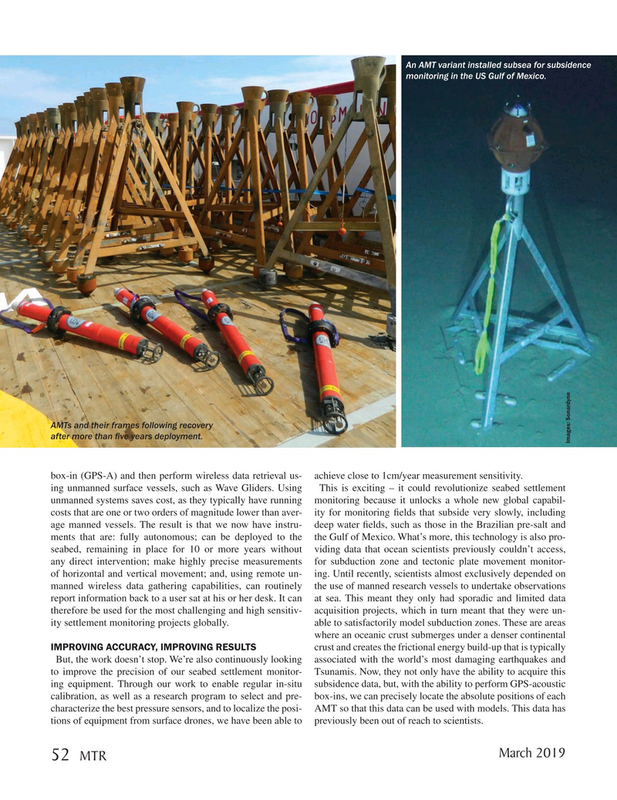 An AMT variant installed subsea for subsidence monitoring in the US Gulf of Mexico. AMTs and their frames following recovery after more than ? ve years deployment. Images: Sonardyne box-in (GPS-A) and then perform wireless data retrieval us- achieve close to 1cm/year measurement sensitivity. But, the work doesn’t stop. We’re also continuously looking associated with the world’s most damaging earthquakes and to improve the precision of our seabed settlement monitor- Tsunamis. Now, they not only have the ability to acquire this ing equipment. Through our work to enable regular in-situ subsidence data, but, with the ability to perform GPS-acoustic calibration, as well as a research program to select and pre- box-ins, we can precisely locate the absolute positions of each characterize the best pressure sensors, and to localize the posi- AMT so that this data can be used with models. This data has tions of equipment from surface drones, we have been able to previously been out of reach to scientists.